Heard of that movie called The Water Diviner, directed by and starring Russell Crowe? Maybe not. 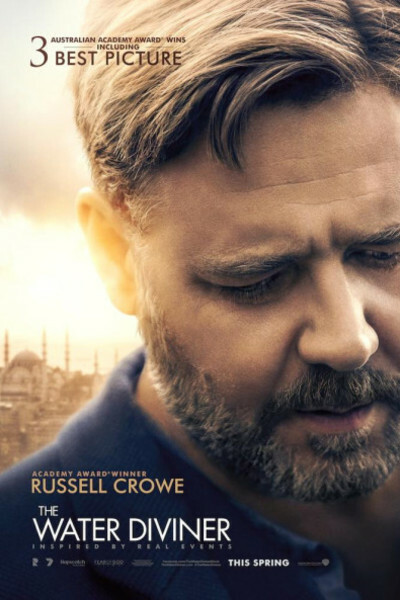 The action takes place in 1919, four years after the devastating Battle of Gallipoli, when Crowe’s character embarks on a journey from Australia to Turkey to discover the fate of his three sons, who have been reported missing in action. It’s rated R, but feels more PG-13, earned solely because ofa few bloody battle scenes—none of which feel particularly Full Metal Jacket or Saving Private Ryan. Crowe does a suitable job directing, though it’s clunky at times, but admittedly never amateurish. The Battle of Gallipoli is one with which I was entirely unfamiliar, so learning about it was interesting, but the monkish performance by Yılmaz Erdoğan is really the heart-filled center that holds the entire film together. The early scenes, which occur in the northwestern corner of Australia, are breathtaking. More than anything, though, I enjoyed the score and Crowe’s performance as an actor. He is in full-on “John Nash [A Beautiful Mind] gentle mode” here, at times sheepish and quiet, where he absolutely shines. I’d seen his interview on Charlie Rose last week, and though much of what he says is fascinating, he doesn’t quite know when to become silent and when to listen. Fortunately, in The Water Diviner, he does, and it’s in those still and stolen moments that I remember why he held so much promise at the outset of his career (think L.A. Confidential or Mystery, Alaska). As he gets long in the tooth, it’s clear that he’s begun thinking deeply about his own children and his own legacy, and I suspect—very strongly—that he will direct more in the future, and all the better each and every time. The Water Diviner is not quite epic, but it’s close. And for his outing as a first time director, good grief, could one expect much more? It’s a solid first lap, and I will definitely be trackside for his second.